Getting a local SIM card in Singapore is as easy as popping into the nearest convenience store with your passport, and I’ve already written about how to buy one. However, if you need a prepaid 3G micro SIM card to fit your iPhone or iPad they are only available at select locations. A rare species -- the Singaporean prepaid micro SIM. 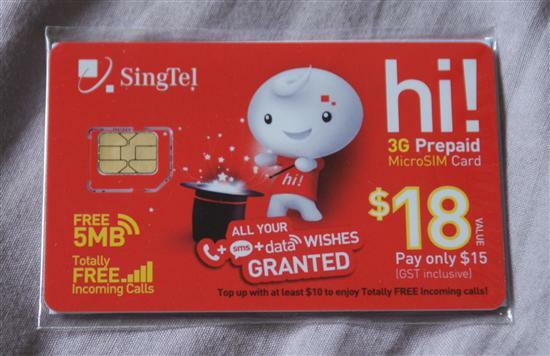 Singtel offers its 3G prepaid hi!Card in a micro SIM version. It costs S$15 and comes with S$18 stored value, free in-coming calls, and 5 MB of free data. For more data, Singtel has the best rates with plans like S$1 for 10MB valid for 10 days or S$7 for 1 GB of data valid for 7 days. While voice service works right away, you need to activate the data service before you can start surfing (follow the instructions that come with the card). Singtel’s prepaid 3G micro SIM cards are only available at Singtel retail stores – not at convenience stores like 7-eleven. There are many convenient locations including Bugis Junction and Ngee Ann City on Orchard Road. Similarly, Starhub also charges S$15 for their 3G prepaid micro SIM card, but it is only available at UOB Foreign Exchange Booths at Changi Airport. More convenient and designed especially for short-term visitors is the “Preferred Tourist Prepaid Card” which is available as a regular SIM or a micro SIM. It also costs S$15 and comes with S$18 stored credit, 20 free text messages, and 30 MB free data. Additional data costs S$2 for 30 MB valid for 3 days, $4 for 200 MB valid for 3 days, or $7 for 1 GB valid for 7 days. Starhub’s “Tourist” prepaid 3G micro SIM is available at Starhub retail shops, Esplanade MRT station, and selected shopping malls like Ion Orchard, Suntec City, and Funan Digital Mall. A full list of retailers is available here. While you certainly don’t need to be a tourist to buy the “Tourist” SIM card, it expires after 90 days unless topped-up (more Singapore SIMs expire after 180 days without top up). Don't forget: you need your passport to buy any prepaid SIM card in Singapore!